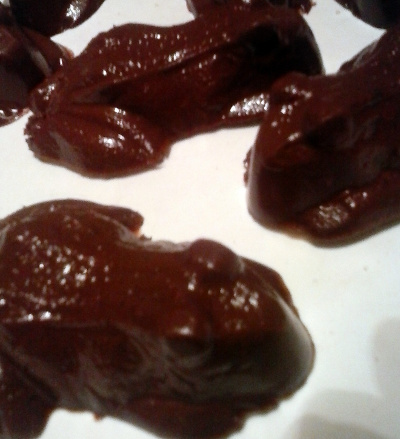 Now, I've admitted my lack of J.K knowledge in the past, and while it hasn't improved at all, who could resist Chocolate Frogs?!? Step One: I bought the detailed molds she mentioned from Amazon; and Step Two: I MADE a batch! I liked the idea of the pretzels for crunch, so that's how I started. 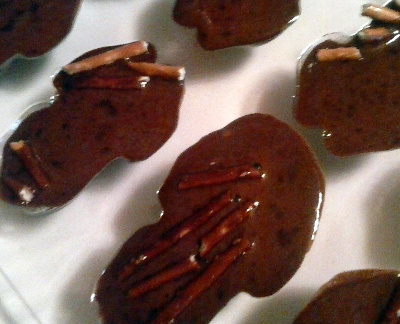 They floated, but if I had waited, my molds would have overflowed. After about 10 minutes at room temp, I used a chopstick to push them down – a couple times – before I put them in the fridge. 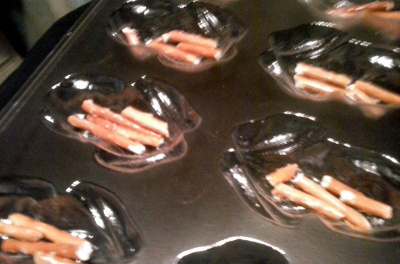 Using this mold with the addition of pretzel bites, a single batch made enough for three+ trays, or over two dozen frogs! And of course she gets the molds, recipe, a couple boxes of gelatin and one of Dark cocoa (I used “regular” cocoa for my batch) – I truly hope she can find sugar, milk and vanilla, or my baking gal is gonna be lost, lol!